Maths activity: How many eyes do we have in our class? We are learning to count in 2s, 5s, and 10s. How many eyes do we have in our class? If our mother's gave us 5 kisses each, how many kisses would we have? We each have 10 toes, how many toes do we have altogether? We have had a great start to 2017. We have walked around the school so we know where things are and who can help us. We have some awesome things planned for the rest of 2017. 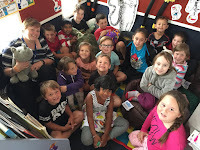 Please keep a look out on our blog for exciting things that will happen in Room 15: Totara. We have an exciting year planned. I look forward to meeting all of the new students to Room 15: Totara. Students are required to have their stationery for the first day of school. We will basically start formal programmes on day one. Students who do not have stationery make it harder for the teacher because they have to find gear for students to use. Because we don’t carry school stationery we often find it hard to find gear for students to use while we are waiting for them to bring their own. Please help us to help your child get off to a good start by having their stationery on day one.